We brought a Pomeranian Chihuahua mix into our house in December. I had grown up with toy poodles so I expected it to be an easy transition. Apparently our puppy had other ideas. Last week he ate my last pair of glasses. He had previously chewed apart two other pairs. So this morning I had to go to the eye doctor. After exams for both my husband and I, most of my day was gone. At least now I can actually see since I was also out of contacts. It's so much nicer to be able to see the television show that I am trying to watch. This weekend also marks the first part of my oldest son's summer vacation. Yesterday my two boys decided to mark the occasion by fighting the whole day and than telling each other that they would rather be only children. This is going to be a long summer. Since both of my sons are now home all day I have been baking and cooking more than usual. Last week I tried a new recipe for Yogurt and Chia Seed Muffins from the Detroit Free Press (via the Charleston Gazette-Mail April, 14 2013). This recipe has 11 ingredients. It takes 35 minutes of total time, 10 minutes of which is active and makes 12 muffins. I did make a number of changes to the original recipe. First I eat gluten free so I used gluten free all-purpose baking mix. Since the baking mix that I use already has salt, I left the salt out of the recipe. The only yogurt that I had in my fridge was Greek style, so that is the variety I used. I chose to add the cinnamon sugar topping and I used foil baking cups to prevent the muffins from sticking. These muffins were still a little soft when they came out of the oven, but they firmed up as they cooled. My kids really enjoyed this recipe. It is a great way to use chia seeds in a baking recipe. Chia seeds do not have flavor by themselves, so they are great to add to oatmeal, smoothies and baked goods. With 6 grams of protein per muffin they are a nice way to add extra nutrition to breakfast or a morning snack. 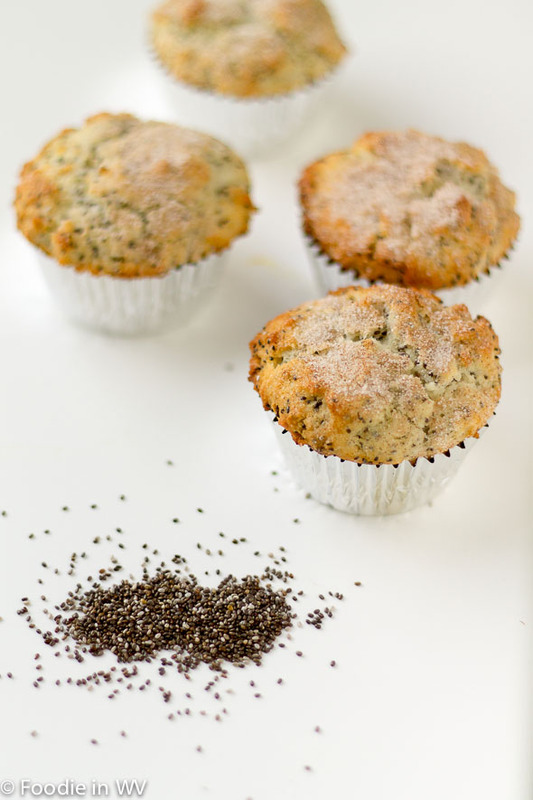 For the recipe go to Chia Seed Muffins. Welcome to summer! There is part of me that loves when my son is out of school, it seems less hectic. Of course, I am just as anxious at the end os the summer for him to return (smile). Chia seeds have really gained popularity which is good because they do in fact add a nutritional punch to foods. I am the same way, I love it at the beginning of the summer, but I am ready for him to go back at the end :) Chia seeds have definitely gotten much more popular, you can find them everywhere now! My boys are like that, too. They don't get out until the end of June, but they fight all the time, so I think we are in for a long summer, too. Thanks for such sweet comments :) I'm sure that they will be great friends when they are older, they just have to get there first! I never heard about chia seeds. This sounds so different. I bet the yogurt kept them nice and moist too. They are great to add to oatmeal etc. for a nutritional boost. I was the Jan Brady middle child growing up with two sisters, fighting all through the summer breaks because we were in each other's faces all the time. My younger sister and I shared a bedroom until I was 17. Needless to say I wished I'd been an only child too! These muffins look like a great defuser for summer vacation tantrums. Better still, for a lovely relaxing Sunday afternoon with a cup of tea! My mother was the oldest of 12 and they fought all the time even as adults :) These muffins were a good way to distract the fighting and were great with a cup of tea in the afternoon for me to unwind.